I’ve taken thousands upon thousands of photographs in my lifetime. Aside from the every day, the opportunity to visit over 35 countries has gifted me with the ability to document some amazing moments – beautiful Italian architecture, stunning tropical sunsets and portraits of my family in locations that now hold a special place in my heart. And of course our destination wedding (obviously not taken by me), but some of my favorites nonetheless. But in the digital world we live in, I tend to take all these photos for granted. Instead of being proudly displayed throughout my home, they’re often relegated to a digital hard drive, never to be seen again. In an effort to change that, I’ve been working to get them organized, edited and printed, and I started with our destination wedding photos. Now that there are so many ways to print your photos, I wanted to go through some of the popular options for larger, more prominent displays. 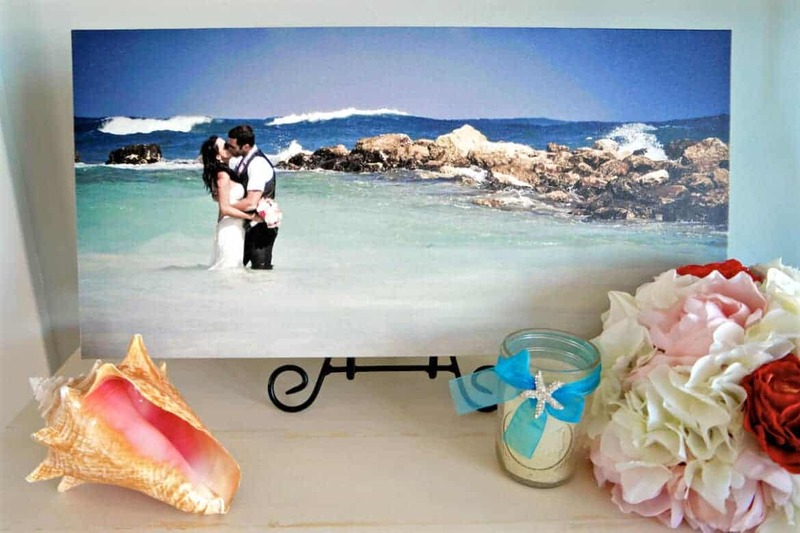 Wood, Metal, Canvas or Acrylic for Your Photographs? It’s hard to go wrong with a canvas print. They look gorgeous as stand-alone products, in a gallery cluster, split across multiple canvas prints or even in frames. 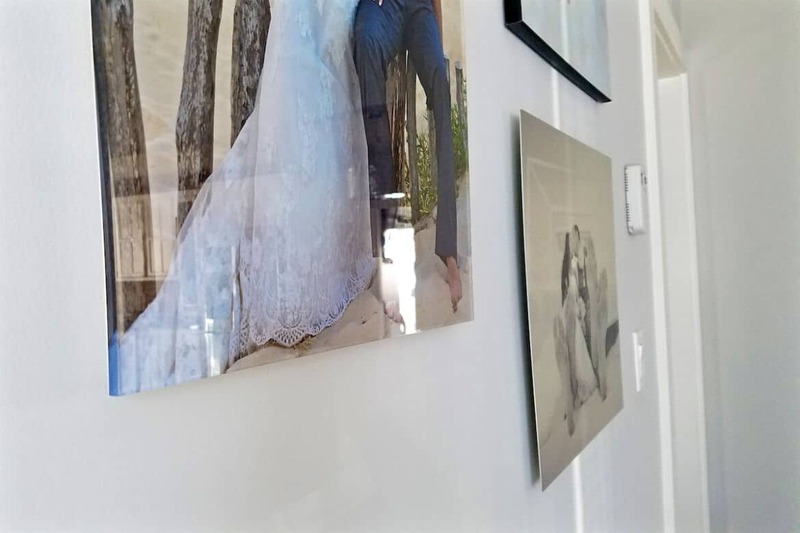 They’re the most well-known wall art items and one of my favorite ways to display photographs because the texture reminds me of painted artwork. Canvas prints are light weight, budget friendly and the photo can be wrapped so that it continues onto the edges – a very nice, modern look! When you don’t want a separate bulky frame, but still want that clean black outline to make the photo pop, printing on a Wood Wall Panel would be a good option. With a UV-resistant, scratch-free glossy coating, these are solid pieces of art that usually come as one continuous piece – ready to hang. Of the four styles I am covering today, this one I think most resembles a glassy photographic print. Tip: Try to avoid placing directly across from a window or strong light source as these tend to easily reflect glare. Metal wall prints turn images into vibrant works of art with ultra-high definition colors, intense blacks and a gorgeous muted yet vibrant finish. The best photos for metal prints are those with high contrast. Think tropical sunsets with fiery colors or like I chose, a black and white image. One of the things people love about metal prints is due to the way they are mounted, they create this awesome floating effect! Metal prints do require a little bit of care. You will want to keep them indoors, out of direct sunlight and handle them with care to avoid scratching. For cleaning, use a glass cleaner and rag. Bonus: metal prints won’t yellow over time! 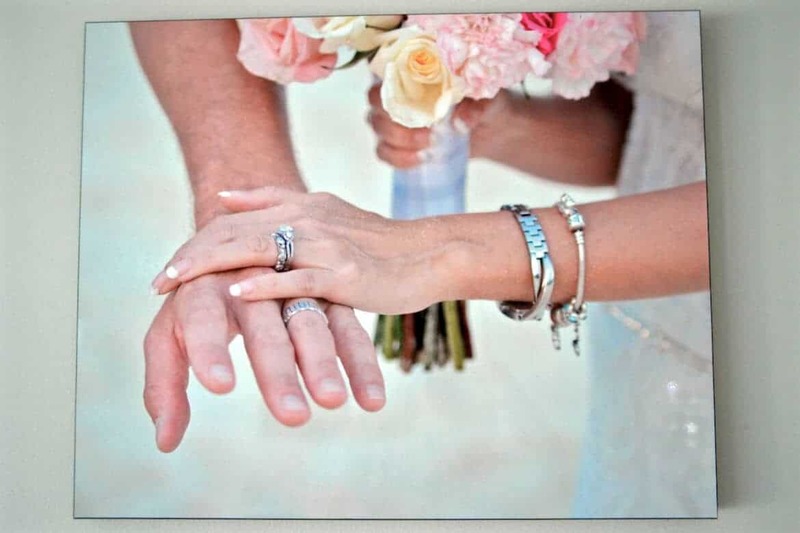 Acrylic prints offer a beautiful and modern way to display your photos. 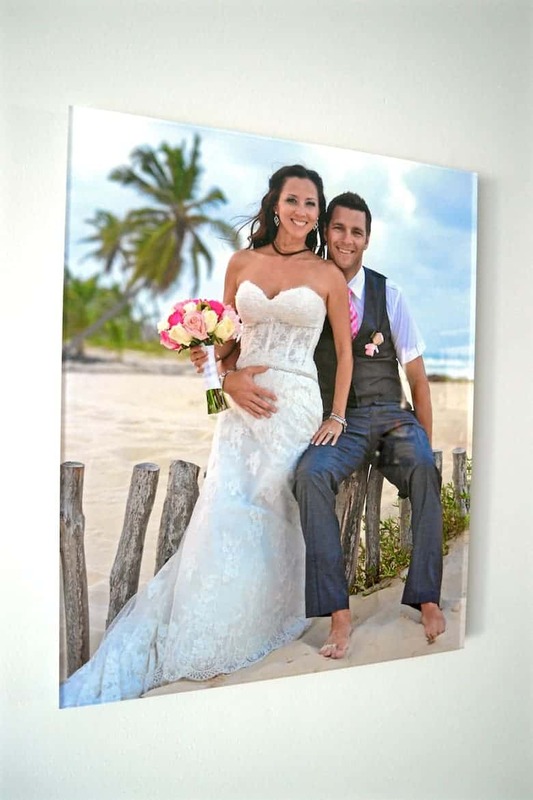 People are always wowed by acrylic prints because of the vibrancy, color, and depth they give an image. This is due in large part to the thick, glossy acrylic that is over the picture. While you can print just about any image on Acrylic (black and white, color, monochromatic, high contrast, vibrant, portraits, landscapes etc) it really enhances photos that already have vibrancy and contrast in them. Bonus: acrylic prints are shatterproof and very easy to clean. When creating gallery walls in your home it’s important to think about mixing media. For instance, a wall of canvas photos doesn’t hold the same movement as you would find by mixing Canvas and Metal prints. Likewise, a viewer may be overwhelmed by a wall displaying only Acrylic and Metal prints because they both offer vibrancy and contrast. Wood prints look great mixed among canvas prints or large wooden framed photographs. Additionally, you can mix bare canvas prints with framed canvas to add dimension to your wall. Photographs make the best gifts, but skip the boring 8x10s. Instead, give the coffee lover in your life a Custom Photo Travel Mug, or a Photo Mouse Pad is perfect for someone who works at a desk all day. My mom is notoriously cold, all the time. So she would love a Custom Photo Sherpa Fleece Blanket and I’ve yet to meet a grandparent who didn’t love a Custom Photo Pillow. Organizing and editing the photos is the easy part. Getting them printed is a little harder due to my hectic travel schedule. Thankfully, CVS is helping me “photo my way,” by making it as convenient as possible to get my photos printed. 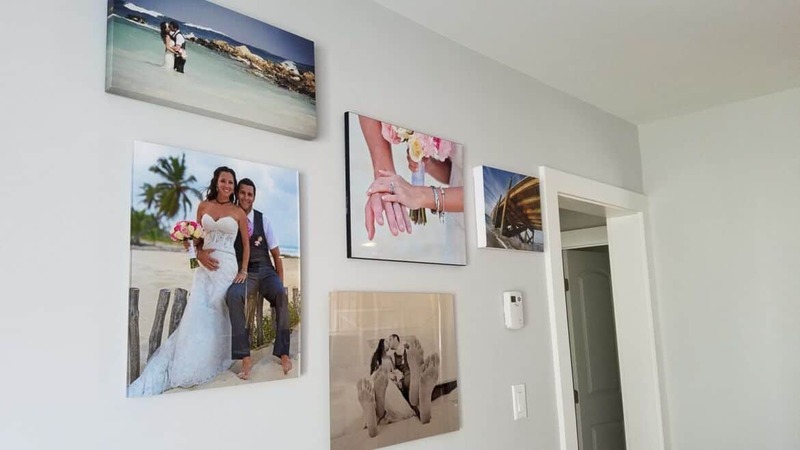 Whether it’s by creating customized wall art on CVS.com and having it shipped directly to my home, or in the case of photo gifts, I can have them shipped directly to my family and friends homes. I’m proud to partner with CVS Pharmacy for the How Do You Photo campaign. I am being sponsored by CVS Pharmacy for my posts and activities, but all opinions expressed are my own, and all product claims or program details shared should be verified at CVS.com or with the appropriate manufacturers. This post of yours was very useful!!! Thank you so much. I was trying to decide which medium would look the best, and your comparison was excellent. I already have a canvas print, and therefore, was looking for a different medium and couldn’t decide between metal and acrylic. I went with acrylic. I am excited to see what the finished product will look like. Thank you, once again. This post really helped me out a lot. Have a grand day. Cheers!!! I’m so glad you found it useful! I would love to know what you think of your acrylic print once it arrives. I love this! Making photos stand out is the best. 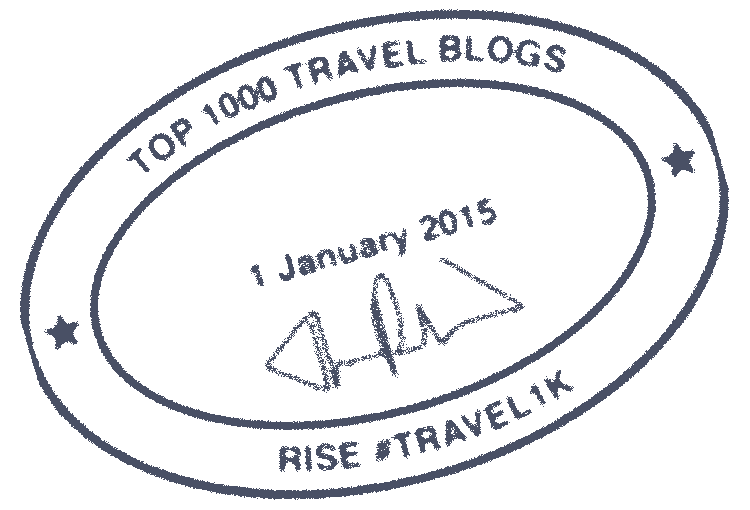 This is an awesome idea – I love the differences and learned so much with this!